Ever since our wonderful Nakazawa omakase experience, J and I have been more curious about the world of sushi in Manhattan. So when we asked a Japanese native living in Manhattan for his favorite place and he says Sushi Dojo, we listened. "It is the best omakase for the price!" he says passionately. 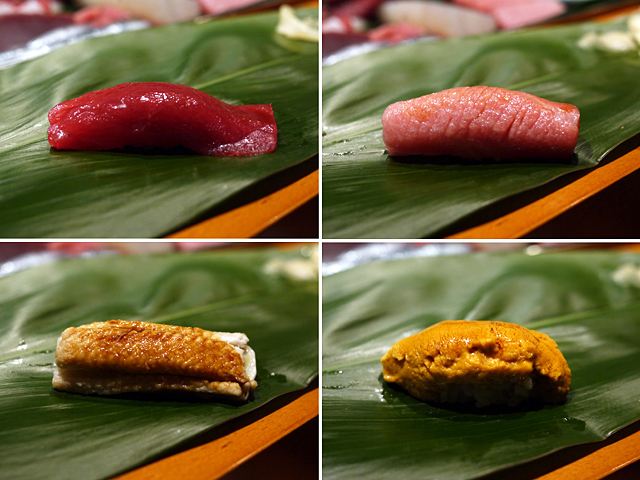 Sushi Dojo is relatively new in the NYC food scene, it opened less than a year ago in June 2013. It's headed by Chef David Bouhadana, a 27-year old French-Moroccan sushi chef which might puzzle you at first. Except Chef David's been a sushi chef for 10 years, have trained in Japan for 3 of those years and speaks Japanese fluently. It's obvious he's passionate about his sushi. When we arrived at 8pm on a Saturday night, our seats weren't ready so we were escorted to an open table where we started picking out our sake for the night. Dojo features a large sake menu and they are nice enough to offer a quick sake tasting from a selection of 2-3 bottles to you so that you could choose for the night. Great for people like me who are still trying to figure out the differences between junmai and daiginjo sakes. • Firefly Squid - so cool, check them out! The meal ended beautifully with a tuna handroll, notably one of the highlights of the night. The seaweed was fresh and crispy meanwhile the fish was rich from the fatty tuna. I could have had these all night long. Chef David passed it from his hand right into mine. Delicious! 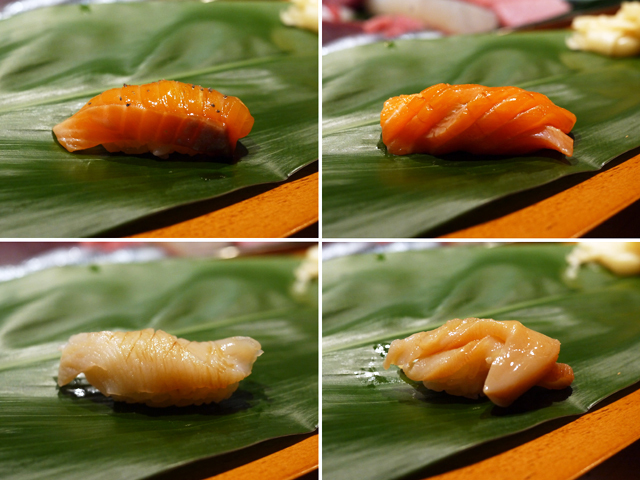 For a while now, I have been wondering what the "right" way to eat sushi was. With hands or no hands? I've tried googling this with no good answer to satisfy my curiosity. Some say to just eat it with chopsticks, others say with your hands. I've seen plenty of people at the chef's counter eating with their hands, so I finally decided to ask Chef David and he gave an answer that I can live with. He says he makes the sushi with his hands, and places it on my plate (or in this case, banana leaf) with his hands, so why not eat it with my hands. It almost feels like a sign of respect if you think about it, from the chef's hand to yours. Hell, he might as well be placing the sushi right into my mouth! As the dinner was winding down, we decided to get two more things to end the meal. The first was live scallop, live and straight from the shell. 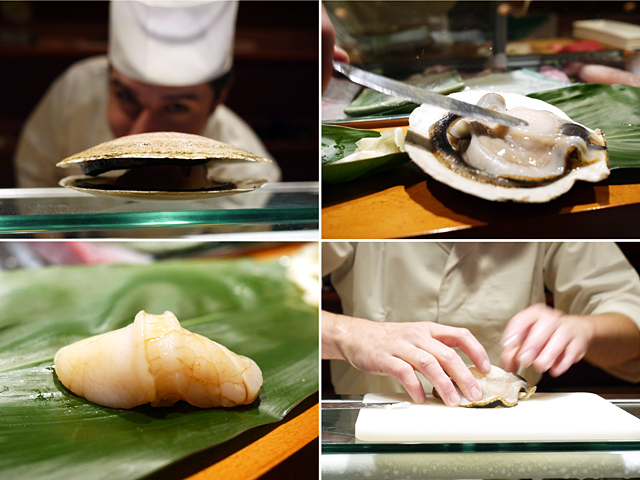 Chef shucked the hotate right out of the shell, and even showed us that the muscles were still twitching. The result of this on top of some rice was just the sweetest and freshest scallop. Amazing for $6 for two pieces! 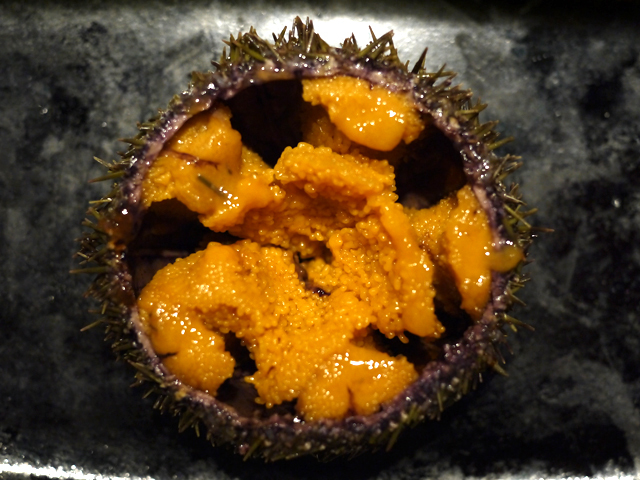 Next up we ordered some fresh uni from Maine as the dessert. We were given spoons to scoop it out of the shell, just like ice cream. I've mentioned in the past that I didn't love uni, but ever since having more and more fresh uni, it's finally grown on me. 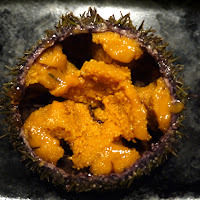 On a scale of 1-10 in deliciousness, I would give the uni here a 6.5, not the freshest I've had, but definitely good enough to eat and enjoy! 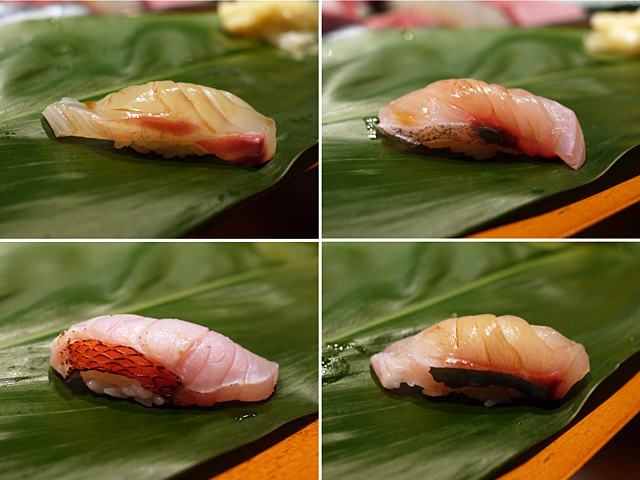 All in all, the omakase at Sushi Dojo was really good. J mentioned there were times during his meal where some of the flavorings overpowered the fish. Particularly the yuzu pepper paste on the Tasmanian Sea Trout, however I really liked the combo. The rice here was noticeably more mushy, a few times I noticed wanting to pick out individual grains of rice as I was eating, but they didn't simply fall apart for me. With that said, Chef David was extremely generous with his slices of fish and I enjoyed each piece as he was feeding it to me. 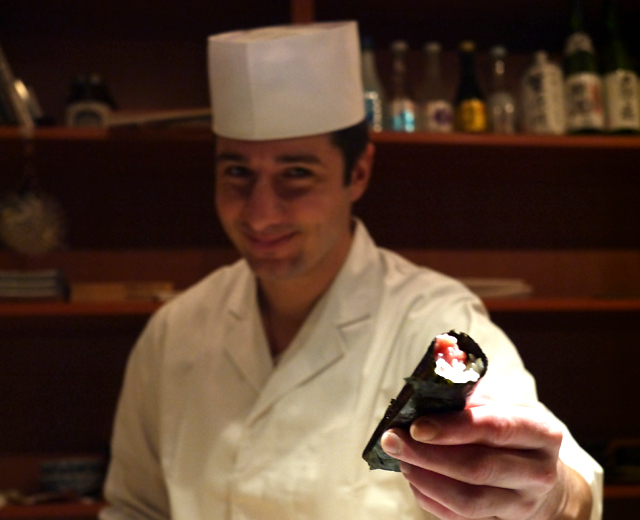 When chatting with David, he mentioned that Sushi Dojo might not be the best place in NYC to have an omakase, but he really does have the most relaxed environment for you to enjoy your meal. With a belly full of great sushi, I think I would have to agree. Definitely come check out Sushi Dojo and sit at their sushi counter to order an omakase! 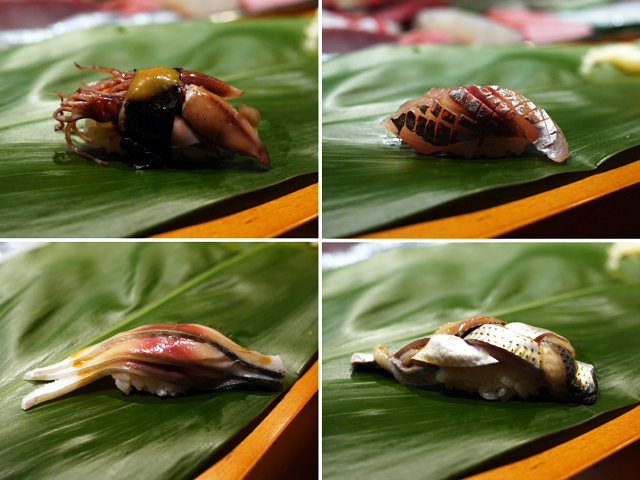 Recommended Dishes: Omakase at the Sushi counter is a must!